Do you enjoy freelance work? Do you have something that you can do quickly to make $5? Then the site, Fiverr, might have something for you. Within each individual category are several sub-categories. For example, within the graphics and design category there are 13 sub-categories including logo design, landing pages, cartoons and caricatures, illustration, and you can read the rest of the offerings for yourself. However, there are also some rather outlandish things offered at Fiverr as well. Just scroll down the home page, and you might find a guy who for $5 will record anything you want (up to 5 minutes) and make it sound like it’s being read by an auctioneer. Then there’s another seller who will speed draw your company logo and video tape her hand drawing it for—you guessed it—$5. Then another seller will sing any song you like and make it sound like Alvin the Chipmunk. You’re probably getting the picture by now of some of the gigs you can and will see at Fiverr. So, the question here is really what can you offer as a seller for $5 and who wants it? At Fiverr.com, buyers will be searching for sellers like you to offer their gigs. Sometimes a buyer will NOT want to search out sellers and just post the gig to be bid on. I use the term “bid” here rather loosely, because you will not be bidding as you do on Elance and Odesk offering a by-the-hour or by-the-project payment option, but bid in the sense that you will be applying against other sellers offering similar services for roughly the same amount of money. Once a seller has signed up for Fiverr with a verified email address and created a password, the seller will also create a profile similar to other sites such as Odesk or Elance, but much simpler–without a work history, education listings, and skills tests. The Fiverr profile will generally have a picture or avatar of the seller with a brief introduction, description of what will be done for the $5 gig, and any additional services. To the right of the seller, will be his/her rating (how many stars out of 5), how many buyers have been serviced, average turnaround time, number of orders in the queue, response time (how fast will questions be answered), what country they are from, length of time with Fiverr, their service level (New, Level 1, Level 2 or Top Rating), and their overall rating or percentage. Below there will be a link in which to contact the seller as well as what languages he or she speaks and any listed subcategories. Based on this profile, a buyer may decide to order the gig for $5. The seller will then acknowledge the buyer’s request as well as ask a few poignant questions related to the gig. 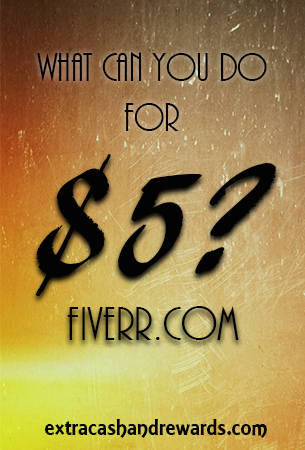 Fiverr will accept the money upfront from the buyer and will subtract a $1 fee leaving $4 for the seller. The seller’s money is held until the work is completed and the buyer is satisfied. Once the job has been completed to everyone’s satisfaction, Fiverr will release the funds to the seller and the buyer will give a “thumbs up” or a “thumbs down” rating with a brief testimonial. All of these thumbs up or thumbs downs are how the rating, rank, and levels get calculated. The most successful sellers are usually the ones who know how to “build” their services. In other words, they offer additional complementary services to each offering. For example, a logo designer may offer logos for $5 and then offer customized business cards for an additional $5 with matching letterhead for an additional $10. Then if you need a faster turnaround than offered that could be an additional $15. Once a seller reaches Level 1 these additional services may be added providing that the seller does have a good ranking. We’ll talk more about levels later in the article. As a seller becomes more favored by buyers, the seller’s rating, rank, and levels will all go up. Naturally most buyers are looking for the top sellers in their searches, but some buyers will take a chance on a new seller if they are on a tight deadline and need fast turnaround or the skill is very specialized. Sellers may also be searched for in categories or subcategories by Recommended, High Rating or New as well as languages and turnaround time. How to Market Yourself on Fiverr? Until you become known on Fiverr and build up your reputation with positive feedback, you will need to somehow standout on Fiverr. Sellers do this in a number of ways. Some sellers have a picture of themselves or an attractive photo of something gig-related under the categories with “catchy” captioning. Other sellers pose holding up a Fiverr sign dressed in a costume. Still other sellers will pose professionally with a short video of themselves introducing themselves and their work. It really is all about good positive feedback, so try to get to Level 1 as fast as possible. Level 1 is someone who has been active for 30 days and completed at least 10 satisfactory gigs. This allows Level 1 to offer 4 extra services/offerings at either $5, $10, $15 or $20 a gig. Level 2 is someone who has been active for 60 days and has completed at least 50 satisfactory gigs. This will allow Level 2 to have 8 extra services/offerings at either $5, $10, $15 $20 or $40 a gig. Check out this great ebook to help maximize your Fiverr earnings! Once Fiverr collects the money from the buyer and the buyer acknowledges that the work has been completed in a satisfactory manner, Fiverr will take $1 out of every $5 or roughly 2% as a fee . The money is then set aside into the seller’s account. It usually takes 3 days to set the money aside. Then 14 days later, the money is released into either the seller’s PayPal or Payoneer account. If there are any disputes, Fiverr has a Resolution Center for those issues which cannot be resolved between buyers and sellers. Should a buyer not be pleased with a seller’s performance, then the order may be disputed or if the seller is taking too long to complete the order, the buyer may cancel. Fiverr will NOT give the buyer a refund, but will issue a credit towards another gig. Yes, Fiverr is worldwide with many countries and languages represented. If your country does not appear to be represented, you may send a request to Fiverr. What Do I Think of Fiverr? I have never used Fiverr as a seller; however, I did use it a few times to have cartoons and caricatures drawn up. In fact, the caricature I use with my Skype account was drawn on Fiverr. I was more curious than anything to see how good a $5 art gig could be, so I tried it. Overall, I was pleased. However, I know people and Internet marketers who call it a “mixed bag” and declare that it is either really good or really bad with no in between when it comes to the services offered. I also have friends who have tried to market their services there. Some did well, some did average, and some canceled their accounts. It’s really just like any other work-at-home job. Some will learn to make it work for them and be successful through much experimentation and hard work, and some will decide it’s just not a match for them. What Do Others Think of Fiverr? If you do a Google or Bing search on Fiverr reviews, you’ll probably see just as many good reviews as bad. I would maybe suggest trying it as a buyer first to see how it works, and if you think it could work for you as a seller. Study what others have done with it to make it work. Just go to Fiverr.com and click on the Start Selling link at the top right hand corner. Good luck! This is a good glimpse into the fiverr market place. Fiverr is an absolute gold mine folks! I started my internet money making adventures in 2005, but I was learning during those early days, and I didn’t start to see significant income until I joined fiverr in 2010. I’m a Top Rated Seller who earns a very significant amount of income there monthly. Fiverr was just the beginning as I’ve learned how to assimilate many online market places successfully and in addition to my fiverr income, I’m building an empire on the web using my creative ability and what I’ve learned about internet things in general. Fiverr has been much like a “paid internship” for me and I strongly recommend that you give it a shot as it can serve as a springboard into even greater endeavors. @dionlynk – thank you for taking the time to write. I am just amazed at all of the success stories that I encountered while writing this article. One guy had actually earned the down payment to a house in two years! How cool is that? I’m also glad things are working out for you too! I have never used Fiverr for my services, but I have used Fiverr to outsource work. Just small jobs here and there. So, hopefully more readers here will give Fiverr a try due to your great endorsement as a service provider. Thanks again for commenting.